Leggat McCall Properties. Trusted Advisor. Sound Real Estate Solutions. 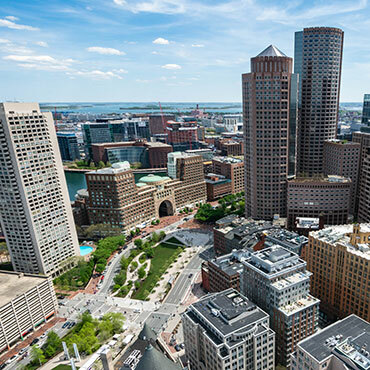 For more than 50 years Leggat McCall Properties (LMP) has been a leading provider of real estate development, project management, and advisory services in the Boston real estate market. We have built our reputation on delivering best-in-class services to a diverse portfolio of private, public, and nonprofit clients on their most complex and challenging projects. In the last 10 years alone, LMP has contributed to hundreds of projects totaling more than $10 billion in capital investment, including 15 projects over $200 million and 50 over $50 million. The company has also developed or acquired about $3 billion in assets as principals, including mixed-use, office, residential, and research and life science properties. LMP has established a dominant presence in the rapidly growing higher education, healthcare, life sciences and technology sectors, with an unparalleled track record of serving many of the region’s pre-eminent universities, hospitals and technology and life science companies. Additionally, much of our institutional practice occurs at the “intersection of mission and profit.” We bring an entrepreneurial mindset to solving institutional real estate problems and currently serve over 30 tax-exempt, mission-driven institutional clients. Our clients will attest that our tools and best practices developed and honed over five decades are consistently successful for both mitigating risk and ensuring an anticipated return on investment. Our experiences as a principal investor, real estate developer and operator lead us to approach each project with an ownership mindset. For us, taking on an assignment means taking on the mission, goals, and objectives of the client. We establish trust and expectations up front, open clear lines of communication, set benchmarks and employ performance metrics to both ensure and measure success. The LMP approach focuses on the strategic alignment of project resources with the needs of the client. We deploy small, scalable, highly competent teams that deliver project leadership and reflect an appropriate measure of project experience and subject matter expertise. As complex problem solvers, we challenge ourselves to identify and mitigate client risk throughout every phase of a project. Timely decision support information is key to project success; clear, concise, transparent reporting and project documentation rounds out the LMP process. At LMP, we are firm believers in predictability—predictable cost, schedule, and high quality. The only surprise for our clients is no surprises.